After surviving a serious accident while riding his BMW R1200 GS, Midstream resident and avid adventure bike rider Colin Morris would like to warn the public to have their bikes thoroughly inspected before saddling up. 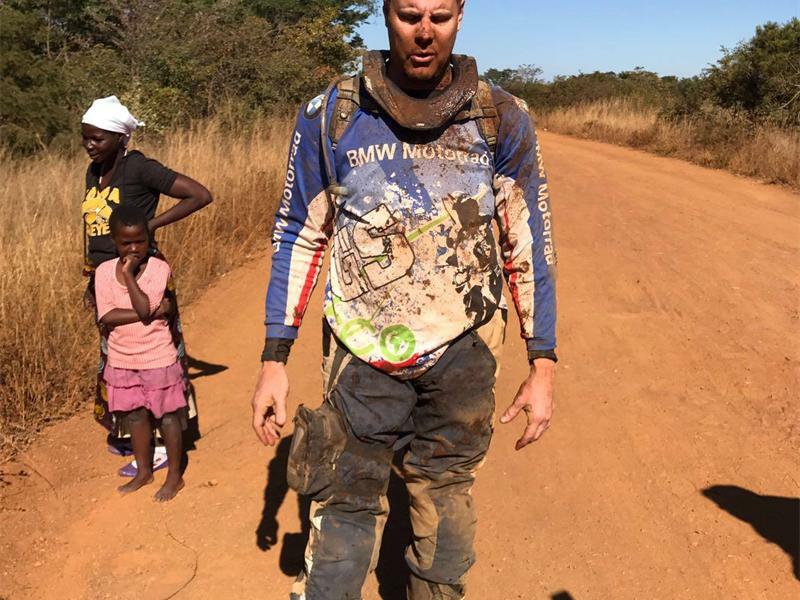 On 15 June, while on a gravel road tour in Zimbabwe with a number of other riders, Morris’s stanchion failed, causing total loss of steering, resulting in the bike locking left into a bush. Morris said he had his bike serviced and the stanchion replaced just before going on his trip to Zimbabwe. “I’m so lucky to still be alive. I was aware of the rumours about the bike having stanchion failure but I didn’t know it would result in an accident of this nature. I need to get the message out there so that people take this seriously. America is apparently issuing a stop sale order, but nothing like that has happened in South Africa. Don’t presume that because you’re riding a beautiful, expensive bike that this won’t happen to you,” said Morris. Colin Morris’ bike is wrecked following the accident in Zimbabwe. 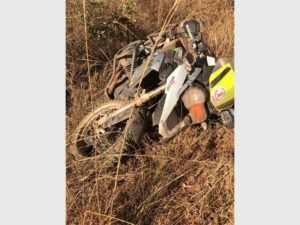 On 18 June, Mark Taylor posted photos of Morris and his bike on the Adventure Riders SA Facebook page, making their 9 500 members aware of the issue and pointing to the lack of action from BMW. On 10 July, Morris issued a claim against BMW Motorrad. Morris’ incident is one of many known cases worldwide. Cape Town rider Tony Georgiou said the front of his bike collapsed on an out-ride near Sutherland in July last year when he was driving at 45km per hour and, upon later inspection, noticed that stanchion separation had occurred. He broke his shoulder, 10 ribs and punctured his lung as a result of the accident. 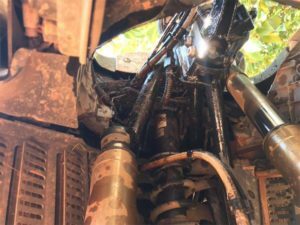 He created a website called BMW Fatal Flaw, where he posted a video outlining his incident and encouraging people to sign a petition acknowledging the problem with stanchion separation and asking BMW to rectify the problem before a fatality occurs. Georgiou knows of 15 incidents from around the world where this problem has occurred. BMW responded to him on 12 June and said the incident was no fault of BMW, but rather as a result of the severe impact on the front wheel which bent the front forks. Morris believes that his case was the tipping point for BMW Motorrad, forcing them to carry out a service campaign from 27 June on BMW R 1200 GS models produced between November 2013 and June this year. In South Africa, 6 100 motorcycles are affected. Pato added, “BMW Motorrad has determined during ongoing field observations that the fixed fork tube of the specified models can suffer preliminary damage due to unusual incidents with momentary high stress without the user noticing the damage. As a result the pressure joint of the fixed fork tube seal on the front suspension can become loose and a slight gap may arise between the fixed fork tube and the seal plugs. According to Pato, it is not yet clear to what extent the seal plug was the cause or consequence of these [known] accidents. Visit Georgiou’s website at www.bmwfatalflaw.com.